If you don't like sims to autonomously jump rope as much as they do by default, then this mod is for you. First of all, if you have Seasons installed, sims will NOT autonomously jump rope outside in winter. Also, when a sim decides to autonomously jump rope, they will ALWAYS use the highest difficulty setting available to them. Relaxed test - Males: if this setting is 0, males MUST satisfy AT LEAST ONE of the extra tests to be allowed to jump rope autonomously. If this setting is 1, sims that meet the Maximum age requirement can jump rope without further testing. Maximum age: Sims older than this maximum MUST satisfy AT LEAST ONE extra test, while others may jump rope without further testing. If "Activity enabled" is set to 1, any sim who has enough points in their Lazy/Active personality trait, can jump rope autonomously. The Default settings allow female children to jump rope at any time, but requires everyone else to pass AT LEAST ONE extra test. Minimum Fitness and Sports enthusiasm are set to 6, minimum Activity is set to 5. NOTE: For the minimum values mentioned above, it's important to remember that they are stored as values in the range 0 through 1000, where 1000 corresponds with 10 points in the sim's control panel. So if you want to set a minimum value of 6 points, for example, you use 600 for that setting in this BCON. 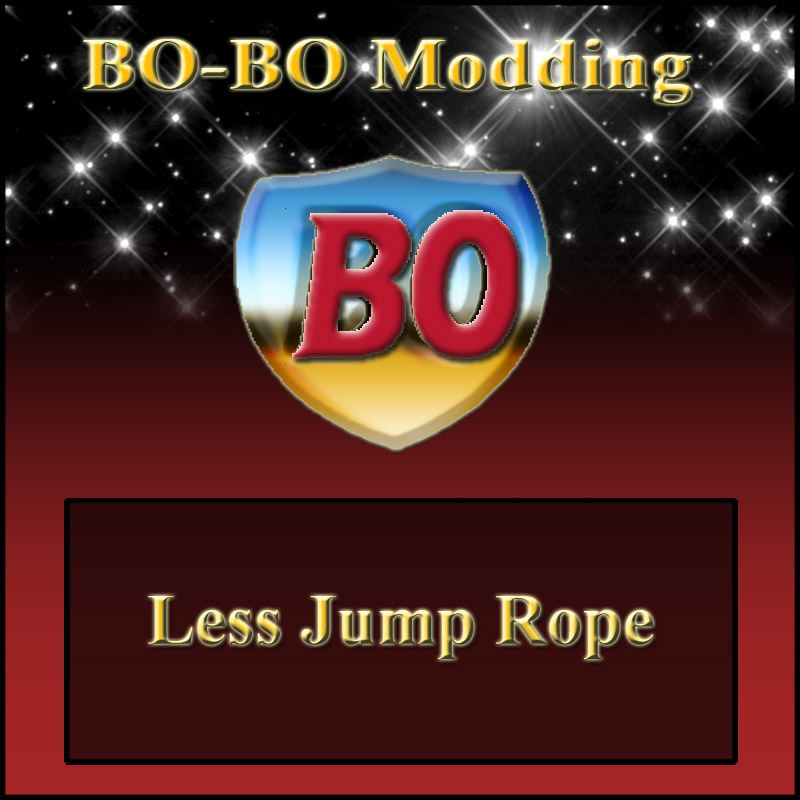 SPECIAL TRICK #1: If you set "Relaxed test" to 0 for both genders AND disable Fitness, Sports and Activity as well, this mod will completely block all autonomous Jump Rope interactions. SPECIAL TRICK #2: If you set "Relaxed test" to 1 for both genders AND set the Maximum age to 4 (Elder), all extra tests will be bypassed, effectively disabling this mod and allowing everyone to jump rope at will (but NOT outside in winter). Compatibilty: If you don't have at least AL, you will NOT need this mod, because your sims can't Jump Rope anyway. Also, this conflicts with TwoJeffs' Play Sanity Fixes and similar hacks by others. For my mod to work, it MUST load AFTER anything it conflicts with! Definitely hate when an adult keeps jumping rope.